We understand that there may be circumstances which make it difficult for you to afford your home loan repayments. If this happens, you should Contact Us immediately. One of the most crucial factors in taking control of these sorts of financial concerns is to take quick action. By acknowledging an issue and acting quickly, you can take positive steps to prevent it from becoming a bigger, and potentially overwhelming, problem. As the term of your loan progresses, making additional repayments or paying more than the required amount will enable you to repay your loan sooner. You may also repay your loan faster if you pay fortnightly. This can also be a good way to ensure your loan payments coincide with your salary or wage payments, depending on your individual circumstances. The graph below shows the difference in the principal and interest owing on a loan if you pay half your monthly repayment on a fortnightly basis. The graph is based on an IBA loan of $347,000 offered at IBA’s standard introductory rate of 3.50% over a term of 32 years. The IBA Home Loan Rate used in the example is 5.25%. By paying your monthly loan repayment every two weeks instead of each month, you actually pay the equivalent of one extra monthly repayment per year. 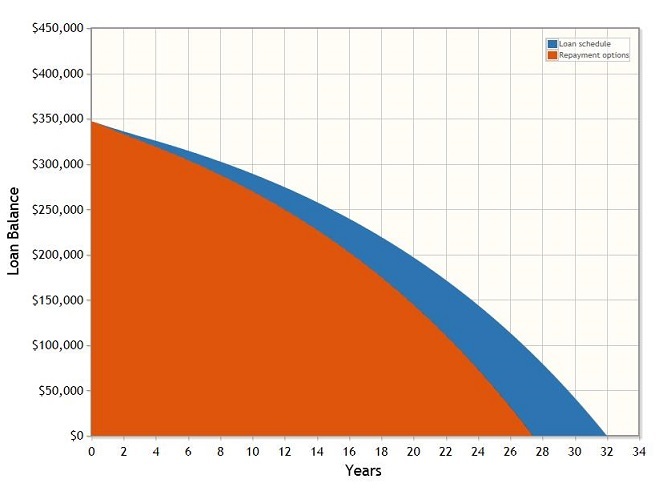 As you can see in the graph, making fortnightly repayments will mean you repay your loan faster. The loan shown in the graph would be repaid four years and four months sooner, saving $56,842 in interest. IBA Housing Loans are provided to assist eligible Indigenous Australians become home owners. If you receive a housing loan from IBA, you must live in the home you purchase. If your circumstances change and you need to temporarily move elsewhere – for example, for a temporary work reassignment – and you intend to rent out your home while you are absent, you must advise IBA. If this situation occurs, IBA may charge a higher interest rate on your loan. For a variety of reasons, such as changes in family circumstances, many people sell their home before the end of their loan term. If you are thinking of selling your home, please contact us to obtain an indication of the amount you will be required to pay to discharge your loan. As your circumstances change, you may wish to refinance your loan with another lender. This may give you access to a range of additional financial products not offered by IBA, including interest offset savings accounts and loans with redraw facilities. IBA charges a discharge fee when you complete your loan, sell part or all of your property, or refinance your loan with another lender. IBA charges a security dealing fee in situations where IBA needs to produce the original title for a property over which it has a mortgage. For example, if you need to make a change the name on the title IBA may need to provide the title to the relevant Land Titles Office in your state/territory. IBA may charge a late payment administration fee when loan instalments remain unpaid more than 28 days after the due date and an acceptable arrangement has not been made. The purpose of the fee is to recover IBA’s cost of administering late payments.